Inventory We are a resale marketplace, not a box office or venue. Ticket prices may exceed face value. This site is not owned by Bojangles Coliseum . The Bojangles Coliseum has a long history of bringing events and sports to the Charlotte metro area. Opened in 1955 as the Charlotte Coliseum it would later be known as the Independence Arena and Cricket Arena before settling on its current name in 2008. 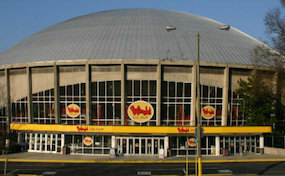 The Bojangles Coliseum box office is located at 2700 East Independence Boulevard in downtown Charlotte, North Carolina. The Charlotte Checkers of the AHL currently call Bojangles Coliseum home. Bojangles.ColiseumCharlotte.com is a privately owned and operated site that concentrates solely in the online resale of all events in the secondary resale market. We are not affiliated with any primary box office, venue, website, or promoter. Prices on our sites tend to be above face value and will change quickly with market conditions. To order tickets to all Bojangles Coliseum Charlotte events please follow the steps online through the checkout or call our friendly staff at your earliest convenience.